The concept of grilling is pretty basic: start the cooking process in the very hot area where the meat is literally seared on the metal grill grates on one side and then the other. Then move it to an area of less intense heat to finish the cooking to a doneness you'll like. There will be lines of darkness that the grill creates on the meat, these char lines actually add flavor but if the steak was left on the grill in the very hot section for too long the flavor these lines leave will be a burnt flavor instead of the charred flavor. It will resemble the difference between burnt toast and not burnt toast. Additionally the marks of the lines and the direction they go will be important to some: the perfect square or triangular marks that a really good grill cook can achieve always looks great. Notice that the grill marks on the steaks aren't black and burnt but a nice carmelized brown. Too high a flame on the grill will burn and char the meat and give it an unplesant flavor. 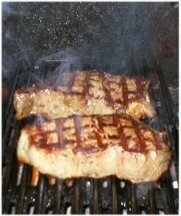 The grill needs to be hot in order to get great grill marks like in the picture; then the heat needs to be maintained for cooking the other side. I always make sure the marks are even on both sides of the steak. Notice that the meat isn't charred and there is a minimum of smoke coming from my grill. If you like a wood smoke flavor, soak wood chips in water and put them on the fire below the grill a few minutes before the steaks are finished cooking. A slight smoke flavor will be imparted onto the steaks. Slightly undercook the steaks by a minute to allow the internal heat to finish the cooking process. Remember, cooking times will vary depending on the thickness of the meat, doneness you like, etc.